Of the 2-billion global vehicle fleet,over 40 million vehicles -- 4 per cent of global automobile ownership– reach end-of-life every year. Large numbers of these get traded to low and middle income countries of Africa and South Asia. About 80-90 per cent of vehicles imported to Africa are old and used. Emissions of toxic pollutants, heat-trapping greenhouse gases and black carbon are worsening public health and climate change risks. Importing countries are fighting the problem with age-caps, higher taxes on older vehicles, emissions-based taxation or outright bans. Exporting countries must also take responsibility to stop old and damaged vehicles from entering the global market,and support in-use emissions management and scrapping of older vehicles in poorer countries. Entire developing world, including vehicle-producing countries like India that use vehicles more intensely, face the challenge of scrapping their large stocks of end-of-lifevehicles without the requisite capacity. 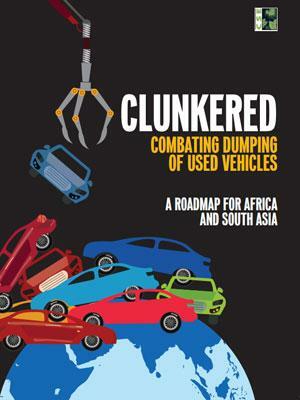 New Delhi, July 23, 2018:New Delhi (India)-based think tank Centre for Science and Environment (CSE), in a new global study ‘Clunkered: Combating Dumping of Used Vehicles -- A roadmap for Africa and South Asia’, (www.cseindia.org)haslifted the lid on the dark underbelly of a large-scale global trade in old and used vehicles from high income to low and middle income countries of Africa and South Asia;the trade, says CSE, is causing massive environmental dumping and toxic pollution. Every year, out of the staggering global vehicle stock of two billion, more than 40 million vehicles approachend-of-life – become old and decrepit. But instead of being scrappedwithin domestic markets, a large number of these are sold in low and middle income countries that do not have the capacity to manage their polluting emissions. “Cheaper price,weak environmental regulations in poorer economies, lure of a rich variety of vehicle models and stronger emissions regulations in high income exporting countries are inciting this unregulated global trade in clunkers (as these old vehicles are called). In high income exporting countries it is more lucrative and cost-effective to export used vehicles than scrap them,” says AnumitaRoychowdhury, Executive Director, Research and Advocacy, CSE. “If this continues unchecked,without the exporting countries sharing the responsibility of addressing this problem, the poorer countries will not be able to meet their clean air and climate mitigation goals,” she adds. Nearly the entire motorisation in Africa is taking place based on imported vehicles. Data on international trade in new and old vehicles shows that Africa importsvehicles from nearly 17 countries, with Japan, Germany, the US and South Korea dominating the trade. While most cars come from these countries, two-wheelers are predominantly from India and China. Cars and commercial vehicles have a higher share of the used vehicle imports. According to the Deloitte Africa Automotive Report, 2016,https://www2.deloitte.com/content/dam/Deloitte/za/Documents/manufacturing/ZA_Deloitte-Africa-automotive-insights-Ethiopia-Kenya-Nigeria-Apr16.pdfabout 85 per cent of the vehicles in Ethiopia, 80 per cent in Kenya and 90 per cent in Nigeria are second-hand. While the vehicle ownership rate in Africa is lower than the world average, the growth rate has increased. Poorer the country, higher is the average age of vehicles due to the predominance of old vehicles on their roads. The average age of light-duty vehicles in the high income and high per capita gross domestic product (GDP)countries like UK, Japan, Germany and France,is less than eight years. But in countries of Africa and South Asia, with lower per capita GDP, the average age is 12-17 yearsor more. This is due to the high import dependence on old and used vehicles. Emissions regulations for vehicles and fuel quality in most vehicle-importing countries are very weak. Even though South and East Africancountries have adopted 50 ppm sulphur fuels, they have not yet opted for commensurate Euro-IV emissions standardsfor vehicles due to consumer pressure for cheaper used vehicles. The rest of Africa uses very high sulphur diesel (in the range of 1,000-10,000 ppm):this does not allow the use of advanced emissions control systems. To combat pollution and climate change,high income countries have adopted expensive vehicle inspection,scrappage and end-of-life regulations,phase-out plans for diesel cars, and low emissions zone programmes to discourage old and polluting vehicles in cities. This has created a large pool of used vehicles in these countries, which are conveniently imported to poorer markets. Even though all used vehicles from high income countries are not old and still have some economic life remaining in them,there is no global mechanism for screening to ascertain the minimum useful economic life of vehicles that can be allowed to be traded. Vehicle-importing countries, finds the CSE study,are enforcing age restrictions, higher taxes on imports of older vehicles, and linking import incentives with emissions levelsand engine sizes. Egypt, Morocco, South Africa and Sudanin Africa, and Bhutan and Nepal in South Asia,have completely banned the import of used vehicles. But there are lessons from these initiatives that must shape the future roadmap, says Roychowdhury. Must combine tighter age restrictionswith fiscal measures, improved fuel quality and emissions standards to discourage dumping: Given the affordability levels, an outright ban on used vehicle import may not be immediately possible in many importing countries. Putting an age restriction along with higher taxes on older vehicles is needed to eliminate the dirty stream. Currently, age caps vary between 15 to three years. In Kenya, a combination of age restriction of eight years and incremental tax has increasedthe prices of imported vehicles and reducedthe demand.But the age cap needs to be more stringent – not more than four-five years. If simultaneously,Euro-IV emissions standards (at the least) for vehicles are adopted across countries,they can take advantage of the improved technologies from exporting countries. Fiscal measures need to be more effective and used with age cap: Thoughseveral countries have increased taxes on older vehicles, these are seen more as a revenue source than a deterrent for imports. Despite higher taxes,the cost of old and used vehicles remainscomparatively cheap and lucrative. For instance, in Uganda,an environment levy favours import of less than five-year-old vehicles; taxes are higher on older vehicles. But this has not discouraged old and used vehicle imports. In South Asia, Sri Lanka has used import taxes more effectively discourage diesel cars and move the market towards cleaner options like gasoline and hybrids. Importing countries have little capability to take steps like emissions-based taxation in the absence of harmonised global emissions regulations and authentic emissions records of vehicles:Mauritius had taken the lead to levy a CO2emissions-based rebate system for vehicle imports,and fixed the age for import at four years. But the move could not be sustained as there was a technical difficulty in comparing international CO2emissions standards. In fact, the scheme ended up encouraging more used vehicle imports over new vehicles (even though the new vehicles got a higher tax rebate), as old vehicles came with certificates making dubious claims of low CO2 emissions that could not be verified! The scheme had to be replaced with more transparent engine size-based taxes in 2017-- bigger enginesattract higher taxes to reduce oil consumption and CO2 emissions. Importing countries planning their own vehicle manufacturing and assembly industry are adopting tighter import measures: Nigeria has developed its own industrial policy to build vehicle manufacturing and assembly industry to improve energy security. It has raised import duties on vehicles substantially and is giving tax incentives to fully and semi-knocked down kits for vehicle assembly. As a result, over the last three years,car imports have reduced:the drop has been especially significant between 2015 and 2016. Nigeria has also banned two-stroke engines and is in the process of notifying 50 ppm sulphur fuel. Ethiopia is also framing its import policy and establishing its own assembly and manufacturing. In South Asia India, which is a vehicle producing country, does not allow import of used vehicles or any vehicle that does not meet its emissions standards. Plug loopholes to stop the grey market: Most countries have porous borders leading to a grey market that undercuts efforts to control used vehicle imports. Often, rules related to transit vehicles become the loopholesthat this grey market uses. For instance, Ghana is facing the problem of a grey marketdue to the special provision of the Economic Community of East African States (ECOWAS), which allows importedused vehicles to operate for 90 days after which they are either returned to the country of origin or have to pay a customs duty to stay on. Vehicle market of South Asia more geographically confined,which is helping the region to take quicker action: The vehicle trade in South Asia is largely dominated by India and Japan. Quicker upward harmonisation of emissions regulations is possible in this region with vehicle-producing countries advancing their standards.Also,more strident steps are being taken by importing countries. Bhutan and Nepal have banned import of used vehicles and have imposed taxes according to the engine size; Nepal has adopted Euro-III emissions standards. Bangladesh has restricted age to five years and has adopted Euro-II emissions standards. Pakistan has gone for an age cap of three to five years. Sri Lanka has used stratified import taxes and an age cap of five yearsto successfully discourage old and polluting vehicles and diesel vehicles;it has also promoted hybrids, electric and gasoline vehicles, and banned two-stroke engines. The risk of being dieselised: The WHO has branded diesel emissions as class 1 carcinogen for their strong links with lung cancer. As European countries phase out diesel cars, there are serious fears about their dumping in Africa which neither has clean diesel nor the capacity to monitor emissions from vehicles. Nigeria has been able to stop dieselisation because of its good practice of pricing diesel fuel higher than gasoline. Mauritius has also succeeded as its fuel price gap is very narrow and the tax on bigger engines is high -- but other countries are vulnerable. Vehicle exporting countries must share responsibility: High incomevehicle exporting countries do not have a fullproofformal mechanism to screen and filter vehicles that have nearly exhausted useful economic life, or vehicles that are damaged in accidents, or have been recalled for manufacturing defects. They need to ensure that their end-of-life and recycling policies effectively destroyall clunkers within the domestic market. This will also require multilateral and bilateral policies for oversight, guidance and monitoring of the global supply chain to establish accountability and responsibility of the exporting countries and companies. Enable scrappage and end-of-life regulations in importing countries: As a substantial part of the life of vehicles produced and used in high income countries is spent later in poorer countries, contributing to the emissions load, a global mechanism is needed to reinvent the concept of ‘Extended Producer Responsibility’. This concept requires manufacturers to take responsibility of take-back, recycling and final disposal of their vehicles within the domestic economy, for the global supply chain. Vehicles in developing countries will require infrastructure for the final burial and recycling of material. Trade forums like the World Trade Organization, regional trade blocks, multilateral forums like the UNFCCC, and country blocks for international cooperation including G8, G20, BASIC etc need to develop a common framework for disposal of used vehicles. Harmonisestringent age caps, minimum Euro-IV emissions and fuel standards, effective import tax measures, and emission-based import criteria across all vehicle importing regions. Implementeffective vehicle inspection, roadworthiness and safety tests for vehicles. Implement end-of-life regulations, and infrastructure for scrappage. Put in place transparent consumer information systemson imported vehicles to help consumers choose safe and low-emitting vehicles. Leverage import policy to zero emissions,promote electric mobility and leapfrog. Build public and consumer awareness about highly toxic and health damaging emissions from old and polluting vehicles -- cheap cars come at very high health costs. Even developing countries that produce vehicles (like India) and use them more intensely and longer need to adopt end-of-life regulations to scrap and recover precious material. In India, about 20 million vehicles have accumulated by 2015 that require scrapping. Enforce stringent measures to stop end-of-life,unsafe,damaged,and recalled vehicles from entering the market – the world needs a well-governed circular economy around vehicles to stop environmental dumping of what is technically a ‘hazardous waste’. Stop diesel cars that are being phased out in Europe from entering markets of Africa and Asia. Reinvent ‘Extended Producer Responsibility’ for the global supply chain so that producers, dealersand recyclers are made responsible for final disposal and recycling. Establish a multilateral framework for shared responsibilities and monitoring of used vehicle trade to stop environmental dumping of clunkers in low and middle income countries. For more details, interviews etc, please contact: Souparno Banerjee, The CSE Media Resource Centre, souparno@cseindia.org, 9910864339.